Sludgebusters is the industry leader in providing San Diego County's septic tank services. For over 30 years, we have been providing prompt, affordable and expert service to our commercial and residential customers located throughout San Diego County. We have performed septic system installations, repairs, pumping and cleaning services, and inspections and certifications for thousands of satisfied customers, and have over a 90% client retention rate, among them valued customers who have depended upon us for years to keep their septic systems running properly. Our owner, Ed Kapelczak, is the president of the San Diego County Sewage Haulers Association, and insists that the highest standards of professionalism be followed by his knowledgeable, experienced technicians. No residential or commercial job is too small or too large for us: We service single family residences, as well as perform large-scale, industrial jobs. We have performed septic system pumping services for sewer plants and pump stations, and have also been called upon by municipalities to repair major sewer line breaks. In addition, we also perform remediation clean-up services when residences and businesses experience serious plumbing system backups, thoroughly removing both solid and liquid waste matter before it becomes a public health issue, and provide this service for above ground building spaces as well as for crawl spaces. During such emergency situations,our highly skilled and experienced professionals have provided the highest quality of work even when called upon to labor around the clock in order to bring a project to completion. 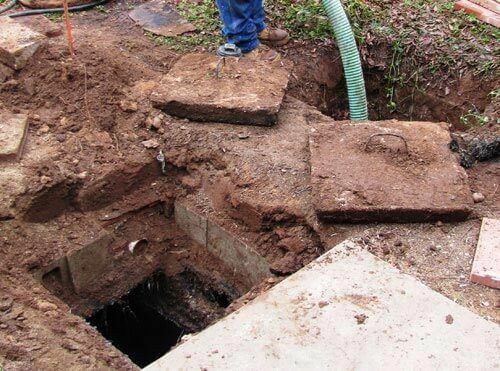 At Sludgebusters, we expertly install only the finest quality septic tanks, and use only the highest quality materials available when performing system repairs. Our excellent, affordable workmanship and prompt response time is unsurpassed in the San Diego County area. Please call us today with any concerns you may have about your commercial or residential septic system. If you are experiencing poorly flushing toilets, hearing gurgling sounds within your plumbing system, or have drains which are not draining properly, these are symptoms which indicate that there is a problem within your septic system. Ed is a true veteran professional that assesses situations and performs the tasks methodically. I was kept informed and witnessed quality workmanship. Enjoyed his presence. Thank you.